We’ve been holding these food races for a few months now, selecting two unsuspecting restaurants and pitting their chefs and delivery boys against each other, completely at the whim of my stomach. Â Slowly but surely, we’ve waded our way through the surprising variety of cuisines offered in what is generally considered a culinary wasteland. Today, my stomach decided it was ready for something EPIC. Â We at BatteryParkCity.com were going to take on Lower Manhattan’s burgers, and we weren’t going to take this task lightly. Â Instead of the usual two contestant race, we were going to order not three, not four, but five different burgers. Three of the restaurants we chose are burger joints: PJ Clarke’s, Zaitzeff, and Burger Burger. Â We added one of Merchant’s restaurants, Pound and Pence, to see how their burgers stacked up, and threw Kitchenette, a chic diner in Tribeca that has burgers on their menu, into the mix as well. We tried to make this race as even as possible; we tried to order all our burgers with the same toppings: Â Lettuce, Tomato, and American Cheese, but Zaitzeff only has white cheddar, and Pound and Pence had plain cheddar instead of American, so we had to take these small advantages into consideration. Â Some restaurants included french fries with their burgers, so we ordered fries from all five restaurants to compare value and taste. Â Also, knowing that Kitchenette had a much longer distance to deliver their food, we ordered from them first, and gave them some leniency in delivery time. –PJ Clarke’s‘ 22 minutes, even though PJ Clarke’s is literally right around the corner. –Zaitzeff placed third with an honorable 27 minutes. –Burger Burger, at 50 minutes, by a mere minute! Burger Burger had the messiest container- we literally had to extract our burger from the mountain of fries and reassemble it- although Kitchenette and Pound & Pence also used a single container for both their burger and fries. Â PJ Clarke’s and Zaitzeff, our fancier burger joints, packaged their burgers separately from their fries. Â PJ Clarke’s placed their burgers in small cardboard containers (like the ones you use at the Whole Foods salad bar), and delivered their french fries in a separate paper bag. Â Although Zaitzeff also used the paper bag approach for their fries, their burgers were wrapped in insulated paper instead of the cute cardboard box. Although I thought PJ Clarke’s burger box was cute, I also thought that the fries that were haphazardly thrown into a box were actually crispier than the bagged fries. Â When I’m eating a soft juicy burger, I like the crunch of a well-fried fry to balance out the textures in my mouth, but maybe I’m just weird like that! For presentation, I’d have to give the prize to PJ Clarke’s. Â For practical packaging, however, Pound & Pence came in first place with a tall plastic container that provided a little heat insulation as well as enough air circulation to prevent the burger and fries from becoming soggy. For this category, some of the qualities I was looking for in the burgers was whether or not the burger came cooked Medium as we ordered, whether the patty was juicy or dry, the quality of the bread and whether or not it complimented the burger patty, and the overall flavor of the burger, bread, and the toppings combined. –Pound & Pence was the only burger that didn’t arrive a nice pink Medium color, but somehow, the overcooked patty was still incredibly juicy, soft, and the most flavorful out of the five. Â Lizbeth detected some marinade on the meat, and this definitely hoisted this overcooked burger from last to first place. –Burger Burger‘s burger (how weird does that sound?) was liked all around, and designated “the perfect backyard BBQ burger” by one of our taste testers. Â The burger was cooked Medium as asked, and was the only burger that had any char flavor! –Zaitzeff won juiciest burger by a mile, and the soft, squisy, sweet Portuguese bun it was served on complimented the meat and the toppings perfectly. Â Although Zaitzeff’s patty wasn’t the most flavorful, their fancy white cheddar & grilled onion toppings definitely made up for it. –Surprisingly enough, next to all these other great burgers, PJ Clarke’s only made honorable mention. Â I’ve always really enjoyed PJ Clarke’s, and before this race, may have even dared to call it one of my top 3 burgers in NYC. Â It’s still a great burger, and we couldn’t find anything wrong with it, but in a direct comparison it just wasn’t as juicy or as flavorful as the other three burgers. –Finally, we have Kitchenette‘s burger. Â What can we say? Â When we added this to our list of five, we certainly weren’t expecting this restaurant to come out on top. Â Kitchenette was our underdog, and unfortunately, this was not a Cinderella story. Â The burger was cooked as we asked, but somehow, even though the patty was nice and pink, the texture of the meat was hard and dry. Â The bread was also really dry and altogether it was like biting into a cork covered inÂ Styrofoam. Â The taste was also reallyÂ off-putting, and I couldn’t decide if it was the stale bread, the vegetables, or the meat that tasted funny. Â I literally took one bite of this, made a funny face, and didn’t touch it again for the rest of the night. –The cheapest and simplest order by far was Burger Burger. Â $9.45 flat for a cheeseburger with fries. –Pound & Pence was next in both value and simplicity- their $10.75 burger comes with fries, and adding cheese to the order only costs you another 99 cents. –The next cheapest order was Kitchenette, which came to a total of $13. Â However, if you order just aÂ bare-bonesÂ burger sans cheese or fries, Kitchenette actually serves the most expensive burger of the bunch, at a ridiculous $11. –Zaitzeff, where a sirloin burger with cheese and fries will set you back $16! Surprised? 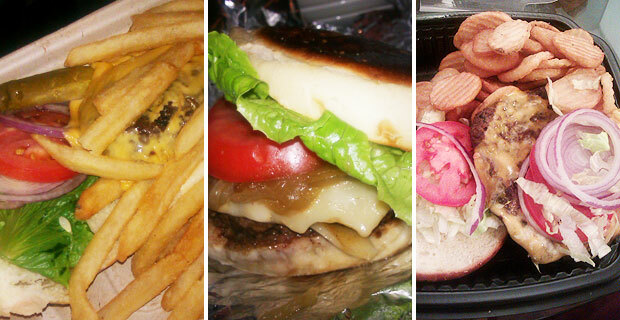 Â Where is your favorite burger in Lower Manhattan?